For your convenience there an Alphabetic Summary of the trip reports. Each entry opens a report. Enter your desired word XYZ followed by site: http://skimountaineerssectionlachaptersc.org/. It will open every file containing the word XYZ in the SMS website. Example: Click on Cirque Crest to find every file containing it. If you want to see full-size images click on the thumbnail-sized photos embedded in the reports. Your monitor should have a resolution of at least 1280 pixels in width, better 1680x1050. Enjoy to read the reports, see the many color pictures and some movies. You'll find a great variety of SMS activities including ski trips, summer climbing and hiking trips, beginners and advanced trips, local and foreign trips. If you like what we are doing, join the fun! If you have done it for a while become a leader and continue the tradition. If you want to post a report of your trip, scheduled or private, do the following: Send text and pictures by e-mail to the active webmaster. A trip report typically includes information about date, location, people, level of skiing/climbing/hiking, route finding, weather, anything unusual or exciting or other personal experiences. Digital pictures should be of good quality and adequate size (say 1000 pixels wide, jpeg format). And don't forget the Slideshow with many fine pictures! The 2017-2018 initially looked bleak, but in February good storms moved in. Unfortunately, no March Miracle. Northern Sierra got average snow fall, but SoCal was below the average. The 2016-2017 initially looked bleak, but the surprise came in Dec-Feb storms. Northern Sierra got the brunt of an atmospheric river, but SoCal got its share too. The 2015-2016 season was supposed to be an El Nino Year but it materialized mainly in the Northern Sierra. Private ski trips were done to Mammoth Mtn, Pear Lake and Mt Shasta. Summer hikes were also done. The 2013-2014 season was worse than that of the previous year. Hoping for an El Nino to come soon. The 2012-2013 season had a low snowpack which was bad for skiing, but good for hiking. The 2011-2012 season was dismal. The 2010-2011 season was very a good one. We had many good storms in Dec, Jan, Feb and March, resulting in an above-average snow level. The 2009-2010 season is a good one. We had storms in Dec, Jan, Feb and March, resulting in an above-average snow level. Thanks, Ullr! The 2008-2009 season started out not too bad, but then precipitation fell below the average. Some people think we get less snow now than in the past. 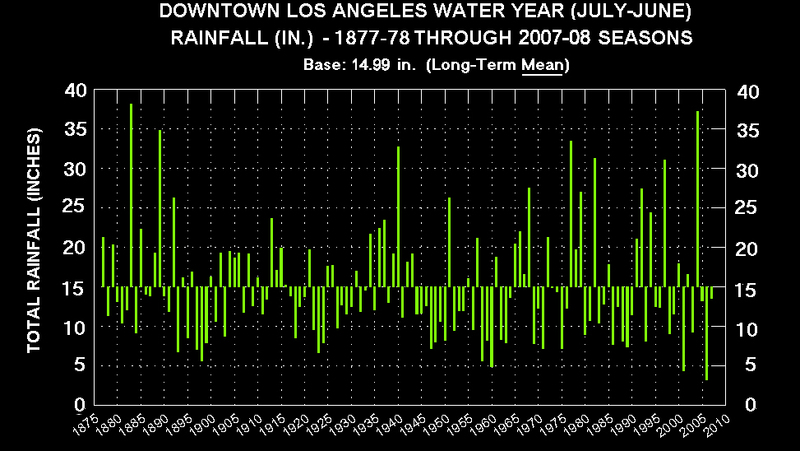 But look at the facts: Rainfall stats for LA for the last 130 years shows no significant change, just large fluctuations around the mean. Alvin led a lot of challenging trips. The summer was long and great for hiking/climbing in the Sierras. In the Fall Owen reminded us we should celebrate the 75'th Birthday of the SMS, which was founded in 1934. Keith Martin made a request to Angeles Chapter to shut down the SMS due to some technicalities, his usual method to control others. The SMS Potluck was a great success. We have a new Central Committee and have many outings planned for the upcoming season. All we need is snow! The 2007-2008 season started with some rain in December 07, but with all the global warming hype, nobody expected the rains we got in January and early February. We are already well above the annual precipitation and may be looking for a long ski season, so we thought. Then came March without rain, April without rain, May without rain. Where have all the snowflakes gone? Ok, there was a parting shot on the Memorial Day weekend with a "dump" of 6 inches, but that's it. Officially, CA is again in a drought. The 2005-2006 season began promising with good precipitation in December and early January. Alas, that was it so far. Dry winds, no local snow, intro trips all canceled. Waiting for a March Miracle... And it came with a vengence! Through mid-April many weekends were stormed out and trips postponed. We had an above-average snow season. But spring skiing was short since the stormy weather turned rapidly into summer heat and the snow became slush and rotten. Summer hikes encountered difficult stream crossings. Summer was dry and hot. The 2004-2005 season began with some unpredicted big storms around the end of the year. Local mountains got so much snow that most roads were closed. By January many regions had already exceeded the annual average precipitation. We had Seattle weather in Los Angeles. Skiing in the local mountains was superb, even better in the Sierra Nevada, but many trips had to be modified due to weather and road conditions. Snow in the high country lasted well into the summer. We also had some nice summer climbing trips. The 2003-2004 season began with some big storms in December. January was initially dry, but good storms followed at the end of January and in February. March was warm and dry. Got some snow early in April, then another heat wave. First of May, mosquitoes bit us while snow camping. Mid May was almost the end of skiing in the Sierras. But in mid June we still had great skiing on the Washington volcanoes. From July to October we also had a great summer outings program of peak climbing in the Sierra Nevada. The 2002-2003 season began with light snow in November, big storms in December, followed by a two-month drought in January and February with only a few minor storms. The season was saved by big storms in April and May ("Mayuary"). The 2001-2002 season began with heavy snow in November and December, followed by a two-month drought in January and February. Things improved in March. The 2000-2001 season was another low snow year with very cold ocean temperatures. There was good snow at Thanksgiving but then little new snow until mid-January. The snow was going fast in early April, but two April storm cycles gave us a few more good weeks. The base was thin, so that the snow disappeared rapidly after mid-May. In spite of the lower snow cover, this season featured a renaissance of the climbing aspect of ski mountaineering. A number of trips involved peak climbs with ropes, ice axes, and crampons. The season produced a great series of ski photos. See the individual trip reports. The 1998-99 season was a La Niña year with early cold storms, a drought in January, and moderate snow February through March as predicted by the NOAA long-range forecasts. The 1997-98 season was an El Niño year with frequent storms, especially in February and late spring. Total snowfall was higher than normal, but not up to record years like 1982-83, 1992-93. The backcountry snow was layered, leading to many sluffs and wet-snow avalanches. The 1996-97 season started very early. Even though there were heavy rains at New Year's, and there were no heavy storms after January, the coverage was well above normal at high altitude. The view from US 395 was deceptive, because the snow at low altitude was melted by the rain and warm weather. The 1995-96 season started late with not much snow until Christmas, but developed into a good year with above-normal snowfall. The SMS skied San Jacinto, San Antonio, Rock Creek, Pinos, San Gorgonio, White, Sardine Canyon, Pear Lake, Thompson Ridge, the Mammoth Crest, Elderberry Canyon, Hilton Lakes, Lassen, and Shasta. A snowshelter course was conducted in the Mammoth area. This was a heavy snow year, with 600 inches at Mammoth, much of it in the springtime. Spring skiing lasted well into July. Listed are five years worth of older trip reports which should still be of interest.